Location:Spokane Valley - South of Dishman Mica & Bowdish on Bates Drive. School District / Schools:Central Valley School District. University High School. Horizon Middle School. Ponderosa Elementary. Shopping / Entertainment:Downtown Spokane 15-20 minutes, Spokane Valley Mall 12-15 minutes, Liberty Lake 15 minutes, Coeur D Alene 30 minutes. Driving Directions from I-90:Drive South on Argonne Road. South of Sprague, road will become Dishman Mica. Proceed south on Dishman Mica to Bowdish Road. Turn right and go south on Bowdish, and stay left. Take a left on Bates Drive and go south on Bates until reaching Aspen Creek neighborhood. Aspen Creek is truly a hidden jewel, tucked away in the south Spokane Valley! This exclusive Paras Homes community provides a variety of excellent views, as well as private and spacious home sites. Enjoy the country feel and wildlife, including deer and moose. Explore the 966 acres of nearby hiking and biking trails which are part of the Iller Creek Conservation Area (almost in your back yard)! Aspen Creek is very close to your shopping needs at the Valley Mall (10 minutes) and downtown Spokane (15 minutes), and is also close to great Central Valley District schools. Chinook walk-out daylight rancher on enormous 35,000+s.f. view lot, in scenic Aspen Creek! Special oversized view lot w/ private open space behind the home! Beautiful custom finishes. Large covered front porch, and huge rear deck to enjoy the views! 4 bedroom, 3 baths, and future basement bed and bath! Large basement Recreation Room and open main floor. Kitchen includes double oven appliances and huge walk-in pantry! Spacious Master Bath w/ soaking tub and large walk-in shower. 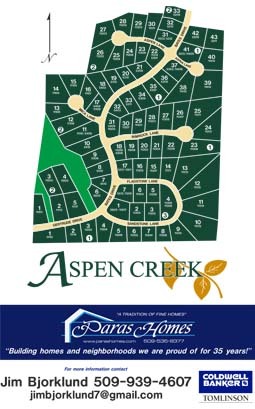 A fantastic Aspen Creek location!